The Holiday Rambler Endeavor is a great option for the first time buyer or experienced RVer looking for a diesel powered, high end RV. Recreational vehicles come in all shapes and sizes with every imaginable option so the decision can be a confusing one. If you are on the lookout for a diesel RV with some really nice options, you should give the Holiday Rambler Endeavor a second glance. The Endeavor is one of the most popular diesel pushers on the road today and there are many, many out there. Starting with the foundation of the custom-built Roadmaster RR8R-Series chassis for very high performance supreme in its class . . . this particular coach offers the best every step of the way. 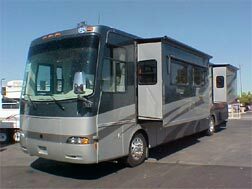 Since they acquisitioned the company in the 90’s, The Monaco Coach Corporation has continued designing and manufacturing the Holiday Rambler product line according to the very high strictures that had always been placed on the RVs. The Holiday Rambler Endeavor is first choice when it comes to style with its deluxe full-body paint. But also takes care to provide for practical needs with the side-hinged baggage door that makes for easy packing. There’s no use in having an incomparable beauty if it isn’t just as efficient and usable as it is gorgeous. And the Holiday Rambler Endeavor fulfills every requirement. 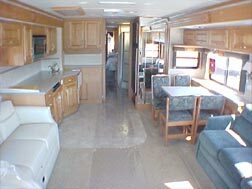 This Holiday Rambler features flatscreen TVs and the same magnificent and plush cockpit seating that is found in the Navigator and other high end diesel pushers by Holiday Rambler. The leather seats have six-way power adjustments and top off the luxurious interior design and upscale features of the Endeavor. You won’t find yourself lonely in the cockpit; these seats are designed to be the prime chair in the house. You’ll always have a passenger in the seat beside you because they’ll want to experience the luxury they offer. The newest Holiday Rambler Endeavor models have seven foot ceilings. There’s no reason to feel cramped when you’re cruising in this particular luxury diesel pusher. The Holiday Rambler Endeavor makes sure you feel right at home. The Endeavor’s engine is just as high end as the interior design of this luxurious diesel pusher. The Holiday Rambler Endeavor takes advantage of all the Cummins ISL 400 engine has to offer. Delivering 350-400 HP at 1,050-1200 lbs./ft. of torque, taking advantage of all that available power is really saying something. The ISL requires no help in meeting all federal standards and will competently pass emissions tests to get you on the road without hassle. This quieter and very efficient engine is an asset that the Holiday Rambler Endeavor feels right at home complimenting. Whether you are more inclined towards comfort, power, efficiency, low engine maintenance, or bang for your buck . . . the Holiday Rambler Endeavor has got it all. If you think it doesn’t have something you are particularly looking for, just ask. You may be unaware of just how many options are available to you and how many features come standard. The Holiday Rambler’s Endeavor is a recurring best seller. The reason for that is an obvious one. You get the utmost in luxury for the affordability we all crave. The finishing touches you don’t normally associate with RV’s are there in all its beauty when you step into the Holiday Rambler’s bestselling Endeavor model. This Holiday Rambler model takes care to watch every detail from the interior décor and color to the top of the line chassis and the exterior paint that is above industry standards to the engine designed for power, efficiency and low maintenance. One and all the features are meant to satisfy your every craving for the RV that not only meets your needs, but surpasses them in every way. >> Shop Our Holiday Rambler Endeavor New and Used Online!